This is a psychological mystery, not a criminal one. And it blew my socks off! Apparently it blew the socks off the nominating members of the National Book Award committee as well. It has been longlisted for this year’s fiction award. Sean Phillips suffered a debilitating injury at the age of 17. 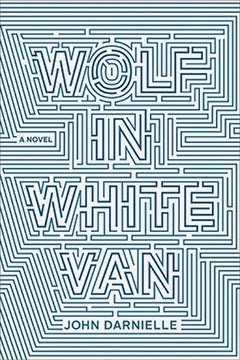 “Wolf in White Van” flicks between flashbacks of the time surrounding the disabling event and Sean’s life many years later. John Darnielle slowly teases out the story of Sean’s second chance. Was Sean haunted by a darkness, a nervousness, an apathy, an ambiguous vision of his life? In the end, is he satisfied, maybe even happy, with who he is and what he does? Sean has developed a role-playing game. He began it before computers were the sine qua non of gaming. With typewritten instructions, Sean sends his players on a gigantic choose-your-own-adventure. Even when computers begin to produce similar games, people still write him from all around the world. They do not meet in real life but are mutually dependent. Ah, but for some the line blurs between Trace Italian, Sean’s post-apocalyptic survival game, and real life. Everyone — his high school friends, the players of the game, his family — has an effect on Sean’s life, but they cannot help him answer the ultimate question he doesn’t even know he has asked. As with his choose-your-own-adventure game, Sean ponders what it means to answer one way and then, after seeing where that path led, to answer in yet another. The title comes from a garbling of lyrics on a record. Sometimes people hear what they want to hear. And in Sean’s world, they sometimes believe what they want to believe. It’s difficult to describe this book without tripping over the surprises Darnielle craftily offers when they are least expected. The review I read, the one that made me want to read this book, pretty much blasted the main surprises right out in the first paragraph. Not fair, I say. Explorers on distant South American mountainsides retrieving flowers from rock cliffs whose petals alone could yield the essence that would make the nauseating syrup in the tinted bottle: but you couldn’t get the essence directly from the petals; it was far too potent for human beings, it’d kill you; first you had to feed it to sparrows, whose livers filtered out the toxins, then cut out the livers and boil all the remaining organs in water. If Sean can imagine sparrow livers, then I can imagine this book is a mystery and award it an MBTB star. There’s a good reason, I guess, why I don’t read two books in a row (or in near proximity) by the same author, especially two books far apart in a long series. One or the other is bound to suffer in comparison. I read the second book in Peter Lovesey’s Peter Diamond series, “Diamond Solitaire,” and okay-liked the whole book and crazy-liked some parts of that book (the 300-pound sumo wrestler, for instance). That was only a few weeks ago. 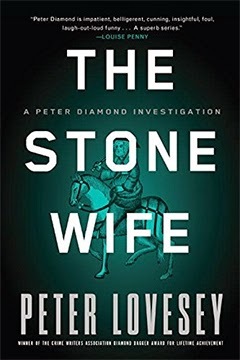 “Stone Wife” is the latest in the Diamond series; #14, if you’re counting. Twenty-two years separates the two books. This is the plot in short: A professor and Chaucerian scholar is about to seal the winning bid on an old sculpture supposedly depicting The Wife of Bath, one of Chaucer’s bawdier tales, when he is shot and killed by masked men who invade the auction. Diamond and his police cohorts set out to find which of many trails should be followed to find the man’s killer. Not being able to narrow down the choices, the police follow them all! Whatever set up this particular piece of the plot and whatever came after was completely overshadowed when about halfway through the book DS Ingeborg Smith finds a gun cache in a suspect’s house, makes a hurried getaway, and then ... nothing. Instead of bolting for the nearest police station/phone box/box of flares/all-night diner to alert the police, she goes home, refreshes herself, then almost casually drops by her office. By the way, she says, there also may have been a dead body falling from a tree in the front yard. But since that was hours ago, good luck on finding any evidence!!! Yes, Diamond cleverly ties everything up. Yes, the solution was a byproduct of one of the many theories the detective team thought up. In the best Perry Mason fashion, the culprit coughs up a confession despite lawyerly warnings. Once again, enjoyed parts (the professor’s naughty widow) and not others (Ingeborg’s hare-brained undercover assignment). Despite Ingeborg's misadventure, kudos always have to be extended to Lovesey on doing well by his creation, Peter Diamond, and the charming and historically intriguing city of Bath. As the naughty Wife herself might say in advice to Diamond, not just about marriage but life in general: Experience, thou noon auctoritee / Were in this world, were right ynogh to me/ To speke of wo that is in mariage. It has taken me a while to figure out what I wanted to say about this book. My respect for Dennis Lehane as a writer and storyteller borders on adoration, especially for his Angie Gennaro and Patrick Kenzie series. He taps deep and tender emotions in his main characters, while also depicting a violent and often unforgiving world. “The Drop” succeeds in doing that, too, but only to a certain extent. I wasn’t sure why I didn’t wholeheartedly clasp this book to my bosom until Jean told me that it had originally been a short story. Now that it has been made into a movie, we have this short book/novella version. Bob is a bartender in his cousin Marv’s bar. He is lonely and there’s a heaviness that hangs over his life. He plods from day to day. He is quiet and it’s not a stretch to imagine that he is the flickering dim bulb in the sign. Then he finds a dog in the trash. “Cassius” changes everything. Bob’s dog needs and loves him. With the help of Nadia, the woman who saw Bob pull Cassius out of the trash, he learns how to take care of a dog. Also, as Bob’s neighborhood Catholic church is scheduled for closure, his life veers even further away from the tedium and routine he had accepted. 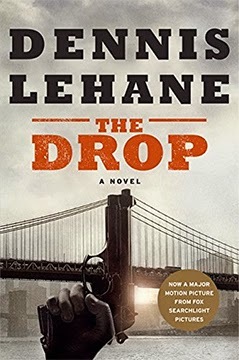 Lehane has added more about what gives the book its title: Marv’s little bar is a drop for the Chechen mafia. He has enlarged the part of Eric, Nadia’s psycho ex-boyfriend. He’s added an NYC detective. There’s a little more about Bob’s life, and maybe that’s the problem. It’s both too much and not enough. A lot depends on Bob’s character. The resolutions of the short story and the novel are mostly the same, but the hit from the short story has more punch because we’ve only had a short time to process what’s happening to Bob. Those bang-up twists at the end are stellar. That part is pure Lehane. The story of “Cassius” is intact from the short story and it, too, is wonderfully rendered. Even though I felt the book’s rhythm was a little bumpy, I would and could never NOT recommend a Lehane book. Icelanders are only concerned with first names, I’ve discovered by reading Arnaldur’s books. The last names, for the most part, are patronymic, reflecting a person’s father’s or, more unusually, mother’s name, so carrying on family surnames is rare. Unusual first names are also rare, since all first names must be vetted by the Icelandic Naming Committee. “Voices” is the fifth book in Arnaldur’s series featuring police detective Erlendur, but the first two books have never been translated into English. Not all of Iceland, despite an insistent assumption on our part, is uniformly icebound and cold. In “Voices,” the setting is Reykjavik near Christmas, and the streets are bare until just before Christmas when the snow begins to fall. Icelandic food sounds very exotic; there’s a lot of talk about ox tongue and boiling various animal parts for Christmas. Erlendur is thinking about traditionally boiling roast lamb for his dinner. There’s a memorable scene in the movie version of “Jar City,” Arnaldur’s first book translated into English, involving a sheep’s head. Apparently foreigners love to travel to Reykjavik to celebrate Christmas. The murder in “Voices” takes place in a swanky hotel that offers a holiday buffet laden with Icelandic food. The only parts of the hotel that aren’t swanky, it seems, are the basement where the dead body is found in a cubbyhole of a room in which the victim was living and the heatless room Erlendur takes while he investigates the case. Gudlaugur was the hotel’s doorman, handyman, and Santa Claus. No one knows anything about him, except that he had been at the hotel a long time. He was found partially clad in his Santa suit, in a compromising position. Erlendur and his mainstay cohorts must tease out facts about the doorman. They finally discover something amazing about Gudlaugur’s past, but does it have anything to do with his death? Arnaldur presents such a tantalizing picture of Reykjavik and the culture there in his books. He adds to that an intense thread that runs throughout the series: Something from Erlendur’s own past is haunting him as he works on this case. As his personal life is befuddled by his past, his drug-addicted daughter, and a budding romance with a forensic scientist, Erlendur’s tangled story becomes just as much the focus as the murder. Although I’ve bounced around in reading this series, I’ve enjoyed each one. The food may be unusual, but the emotions that engender murder are not. It’s been a long time since I read the first in a series and immediately wanted to read the rest. I like putting a mental space between books in an author’s series, custom having the propensity to stale, etc. After finishing “The Last Policeman,” I wanted instantly to jump back in the saddle and ride off to the last page of the last book. “The Last Policeman” won Ben H. Winters the Edgar Award for Best Original Paperback in 2012. This year Winters released “World of Trouble,” the last in his trilogy about a pre-apocalyptic society. “The Last Policeman” certainly deserves the “original” part of the award. An asteroid is on a collision course with Earth, and there’s no Bruce Willis counterpart to save mankind. (Although it’s probably a given that cockroaches will survive.) There’s plenty of craziness as people react in different ways to the disaster scheduled for sixth months in the future. Six months is an awfully long time to contemplate one’s mortality. So much so that some people opt to commit suicide, preferring pills and hanging, for example, to the darkening of the skies and slow obliteration, or worse. When “The Last Policeman” opens, no one knows exactly where the asteroid will hit. It will be another month before scientists can predict that. Some people are quitting their routine and seeking their bliss. They are “bucket listers.” Others have been fired or let go from failing businesses, some of which are megaglomerates. The people who choose to live sit around and mope, run off to New Orleans and party hearty, or continue with life, seeking a new normal. People don’t want to be arrested, because incarceration, even if it’s just while awaiting a trial, probably means a life sentence. Pretty much all crimes have the ultimate in a serious consequence. That doesn’t mean there is no crime. Drugs are big. They cut down on the dread and anticipation of potential annihilation. Fraud is big. Money is still the active currency. Looking to weather the environmental devastation, should you be so lucky? Canned goods are available on the black market, as are guns, but all for a humungous price. A lot of the remaining cops’ time is spent glancing at suicides. Henry has gotten a call on what everyone else is happy to call a suicide and keep on moving. But something bothers Henry, so he doggedly (and sometimes underhandedly) pursues whatever intuition and flimsy clues support a declaration of murder. Does it matter? Is there a karmic justice if an earthly one fails? There is a reason Ben H. Winters calls his book an “existential” mystery. Clever and beguiling. Heartrending and darkly humorous at times. Despite what I originally thought in 2012 when glancing at the back cover description, this is not a sci-fi novel. Sure, it has an apocalyptic premise, but this story is about human nature, about how hearts break and are healed, about how people can rise or fall when faced with the ultimate crisis. Here is my post-apocalypse MBTB star. I was infamous at MBTB for (usually) not reading series in order. Even I will admit my scattershot approach has its bumps. I sometimes missed the lengthy background given to some characters in previous novels but, in my defense, I believe a good author will write a book that can stand alone. If there’s a backstory or character trait that needs explicating, then the author should explicate it. Which brings me to Ann Cleeves’ “Shetland Quartet" and the second book in that series, "White Nights." I read two of Cleeves’ books out of order. Main character Inspector Jimmy Perez was well established in the first and a wet-behind-the-years junior in the next. Cleeves is an excellent writer, however, so all was not lost. Each time, she took care to explain the isolated and small community mindset of Shetlanders. There may be bad folk residing on their islands, but they are the Shetlanders’ bad folk. Cleeves writes about a mixture of real places and fictional towns in Scotland’s Shetland Islands, north of the mainland. The islands are so far north that they experience the odd constant light during summer nights, giving “White Nights” an eerie atmosphere ripe for murder. Biddista is a small, isolated village on the island, but it boasts more than its share of well-known folk. Bella Sinclair is a famous artist and her nephew, Roddy Sinclair, is a famous fiddler. They have brought business and tourists to quiet Biddista. During one of Bella’s art shows, a strange man shows up, falls to his knees and sobs when he sees one of Fran Hunter’s paintings, then claims amnesia when Jimmy questions him. (In “Raven Black,” Fran was an innocent bystander who discovered the murder victim, and in this, she is a blossoming painter and being courted by Jimmy.) When Jimmy leaves him alone briefly, the man disappears. Later he is found hanging in a fishing shed. No one will admit to knowing him. No one was seen with him. Jimmy must notify the higher-ups in Inverness. Inspector Roy Taylor (“the most restless man [Jimmy had] ever met”), another character from “Raven Black,” is sent to head up the investigation. He acknowledges Jimmy’s value in questioning the locals, and the two of them make a compatible, if uneasy, team. It is disturbing to everyone in Biddista that there may be a black sheep among the flock, but it is like dripping water on stone to dislodge information from the inhabitants. Cleeves excels at depicting this slow-moving, closed life among people who must get along to survive. It is obvious that they don’t all love or like each other, but they are a strange sort of family, most of the older folk having known each other since they were babies. Everyone’s strengths and weaknesses are silently acknowledged. Bella is self-involved. Roddy is a wild man. But they belong to Biddista’s history, so they are tolerated. And so it goes with each of the other inhabitants. It will take Jimmy’s intimate knowledge of how such communities operate to spring open the ages-old stories that brought the stranger to his death. One of Cleeves’ other series, featuring Inspector Vera Stanhope, is wrier and has more black humor, and blunt Vera is a more fascinating character than taciturn Jimmy, but “White Nights” has menacing atmosphere up the yin-yang and a killer plot. 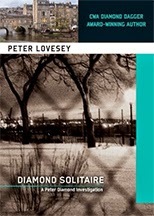 “Diamond Solitaire” is the second in the police detective Peter Diamond series, mostly set in Bath, England. I say “mostly,” because this book takes us to New York City and Japan, and Bath is temporarily left far, far behind. Chubby, volatile Peter Diamond is the star of the type of series rarely seen today: temperate with play-fair detecting. At the start of this book, Diamond has peremptorily quit the police force in Bath. He does not suffer fools and, unfortunately, it does not matter to him if they hold his fate in their palms. He and his wife have moved to London and he has begun work as a night security guard at Harrod’s. He is fired when an unknown person invades the department store, triggering a full-out anti-terrorist response. (This is pre-9/11, as we are reminded by a bittersweet reference to the Twin Towers that makes its way into the book.) The invader turns out to be a nine-year-old girl, mute and abandoned, as it turns out. With his sudden abundant leisure time — when he’s not ineptly attending to some home repairs — he tries to find out who the little girl is and why she was abandoned. Diamond must be more charming than multiple award-winning author Peter Lovesey gives him credit for, because doors open for Diamond and people trust him to be what he says he is and do what he says he’s going to do. He interviews and gains the trust of what appears to be an autistic Japanese girl. Somewhere along the way, he has committed to helping her, come what may. The plot leaps along joyfully as Diamond tries to determine if the girl is from Japan or England or some point in-between. He acquires an astounding patron in a 300-pound revered sumo wrestler from Japan. He befuddles, bewitches, and beleaguers police forces on three continents, most of whom twitch their collective shoulders in surrender to an irresistible force. Read the review of the first book in the series, “The Last Detective." If you have not read Daniel H. Wilson’s first book in the series, “Robopocalypse” (I never tire of saying that, by the way), you must read that first. A hearty, kamikaze few defeated the AI at the end of the first book, so the start of “Robogenesis” deals with the aftermath of the apocalypse. Everyone (and everything) is straggling home, trying to find out what the new world looks like. There is no structure, no central government, no one to pin a medal on a chest made of flesh or metal. There aren’t many quiet moments in “Genesis.” Instead, there’s running, escaping, booming and bombing, shooting, conniving, and mayhem. The heroes and heroines aren’t all flesh-and-blood. In fact some of the most moving moments belong to the robots. Are you rubbing your hands together in anticipation? You won’t be disappointed.